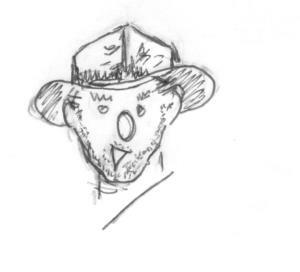 Then Doyle suggested in an interview with The Strand Magazine, “Skiing opens up a field of sport which is, I think unique. This is not appreciated yet, but I am convinced the time will come when hundreds of Englishmen will come to Switzerland for the skiing season between March and April.” Astute fellow. Doyle was followed by Edward Richardson. E.C. or ‘Teddy’, as he was known (for fairly obvious reasons), was born in 1871 in Dumbarton and studied Law at Trinity College, Cambridge, then qualified as a barrister (followers of my blog will note that members of this learned profession seem to get everywhere!). He and his brother spent the 1901/02 winter season at Davos for cross-country skiing. The following year they set up the Davos English Ski Club. EC died at 87 after a game of tennis – golf he dismissed as a game for old men! 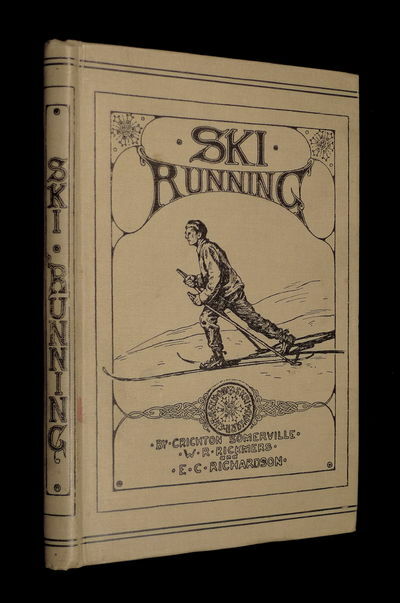 He wrote one of the first books on how to ski, Ski-Running 1904. E.C. Richardson’s book Ski Running with instructions on how to stop! 1903 also saw the beginning of the Ski Club of Great Britain (SCGB). It had its inaugural meeting at a dinner at the fashionable Café Royal, Regent Street, London, on 6 May 1903. There were around 12 gentlemen present, including E.C. Richardson (who was the host), and the idea of the club was to encourage other people to ski and take an interest in the sport. Click here for a report on the meeting. The SCGB produced its first publication, the British Ski Year Book, in 1905 and this was, effectively, the club’s magazine. In 1908 it held its first competition at Kitzbühel which, by 1918, was the principal winter resort for Brits (and all) in the eastern Alps. 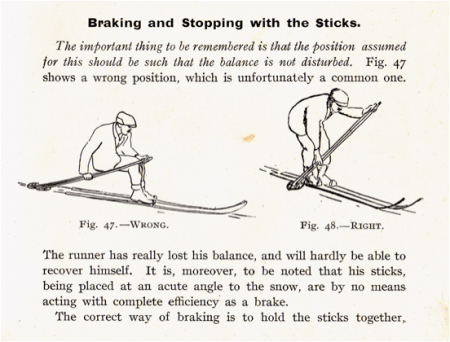 Initially this was just cross-country skiing but by the 1920s alpine skiing (going down mountains fast) began to evolve. By this time other clubs had emerged, particularly the Ladies Ski Club. In 1905, Sir Henry Lunn formed the Public Schools Alpine Sports Club which secured the use of major hotels for the sport. Then in 1908 he set up Alpine Sports Limited to open up many winter sports resorts by organising tours. In the same year he founded the Alpine Ski Club, a gentlemen’s club for ski mountaineers. 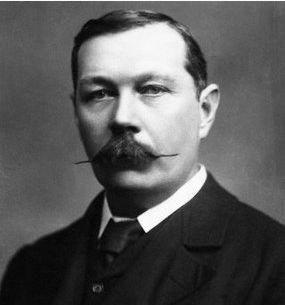 According to Sir Henry’s grandson, Peter Lunn, Sir Arthur Conan Doyle came to stay with Sir Henry in Switzerland and told him that he had decided to devote his life to psychic research but couldn’t think what to do with Sherlock Holmes. 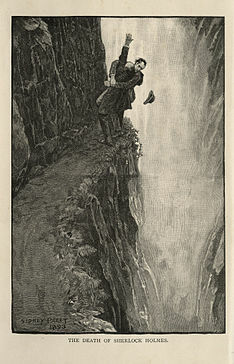 Apparently Sir Henry said, “Push him over the Reichenbach Falls.” Conan Doyle hadn’t heard of them – they are a series of waterfalls on the Reichenbach stream in the Swiss Bernese Oberland region – so Sir Henry showed them to him. The rest, they say, is history (see ‘The Final Problem’, first published in The Strand Magazine in December 1893). Sir Henry’s son, Arnold, was equally prolific in skiing having been introduced to it by his father. 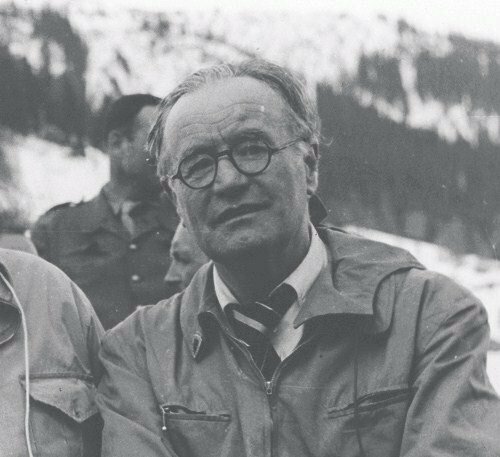 Ge was an Oxford graduate (Balliol) and was a President of the SCGB, 1928-30, having already organised the first British National Ski Championships (including a downhill alpine race) on behalf of the SCGB in Wengen, Switzerland, in 1921. The following year Arnold set up the first slalom race in Mürren. In 1924 he was a founder member of the Khandahar Ski Club (in honour of Lord Roberts of Khandahar). By 1938 Arnold had persuaded the Olympic Committee to include downhill and slalom into the Winter Olympic Games. Back to the mid 1920s and the SCGB started providing a service for its members by producing snow and weather reports for various resorts. By 1928 it had Ski Club Representatives out in resorts in the Alps to look after its members by guiding and advising on the particular resort and entertaining them in the evenings. Also in this year the SCGB managed to persuade the International Ski Federation (FIS) to provisionally approve the British rules for downhill and slalom racing (they were officially approved two years later). By the 1930s the SCGB began organising touring parties to resorts. 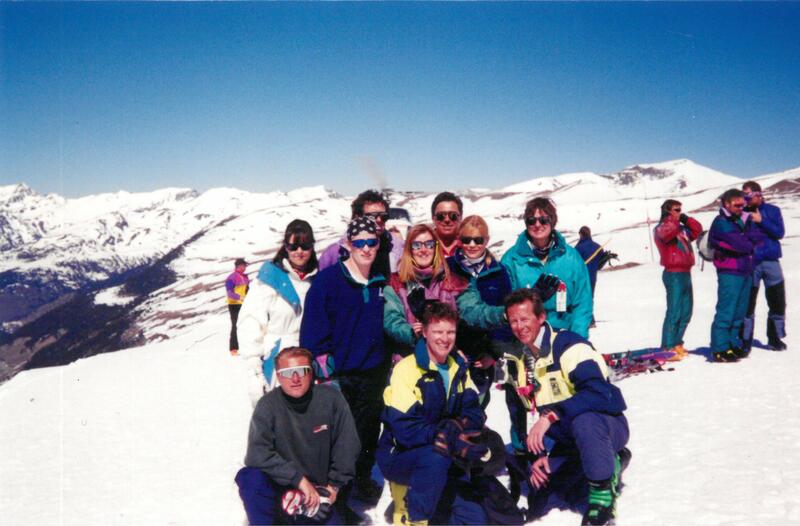 These tours and Ski Club Reps still exist today. In fact, I became one in 1994 and spent 3 weeks of 3 seasons in Soldeu in Andorra. Jim Ring, in his 2000 book, How the English made the Alps, commented, “The Alpine Club and the Ski Club of Great Britain still survive, [but] they are vestiges of an era long gone.” Well, yes and no ……..
“Isn’t it true that you accepted five thousand pounds to compromise this case?” the lawyer repeated. The witness still did not respond.